You all know Blizz's old time system, the ATES. Well, I saw it in his dev pack, and saw that he had never finished implementing all the planned features. So, I decided to finish it for him. This system adds a time and weather system to games that can be turned on and off at will. 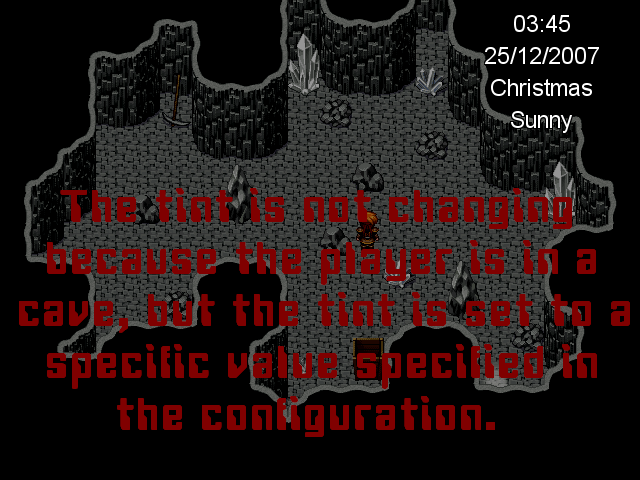 Every aspect of the script is configurable, from the time system, to the weather system, and even the clock hud. The time system allows you to create multiple times of day, each with their own unique and configurable tint. At any point within the day, the script will interpolate between the two closest times of day to create the current tint. In turn, these times of day will fall at different times throughout the year. You can set the values for the longest and shortest days of the year, and the script will determine the current times by interpolating between these. The weather system gives you lots of options, allowing you to customize the bgs, fog, weather effect, and even effects like thunder with screen flashes and sound effects. Each weather effect can be assigned a severity, which influences the likelihood that they will occur. More on this when I talk about seasons. You can also configure a range of durations for each weather effect. When a weather effect starts, a random value in the range will be chosen for its duration. 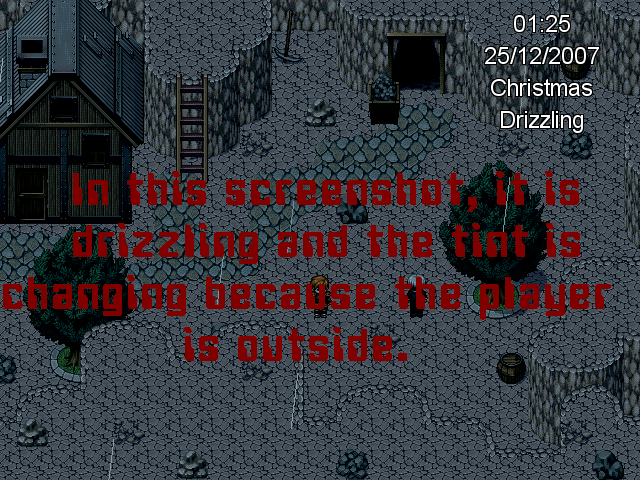 Both the tint and the weather effects are influenced by the player's current location (outside, inside, or inside a dark place). When outside, all tint and weather effects will be applied at full force. When inside, the engine weather effects (rain, snow, etc) and fog effects will not be applied, and sounds and tints will be dampened. When inside a dark place, everything is the same as for inside, except the screen tint will be set to a fixed configurable value. The year is divided into seasons set up in the configuration. Each season has a defined temperature range, probability of weather, bad weather, and very bad weather, and set of weather possibilities. You can also configure various terrains that can influence various aspects of the system. Each terrain has a defined range of temperature modifiers, and a set of weather effect exclusions. You can create holidays, which have essentially no effect besides changing certain lines of text in the clock. Each holiday can either be defined by date or by a position within the month (i.e. first monday, second to last thursday, etc). Finally, the clock is fully configurable, and gives you a wide range of information to pull from and various methods to display it. For instance, you can display either the weekday name (replaced by the holiday if applicable) or the weekday abbreviation. More on these in the instructions in the script. Adds a weather and time system to your game. Disable several pieces of the system at will: the tinting, the weather, the clock, or the entire script. Lock in any particular weather. Jump quickly between time periods configured in the script. Customize your own terrains, weather types, and time periods, as well as the screen tints for these time periods. # savegames. Can cause incompatibilty issues with DNS-es. # - Why does this system use switches to determine whether it's day or night? # attack should be used only at night or only at day. 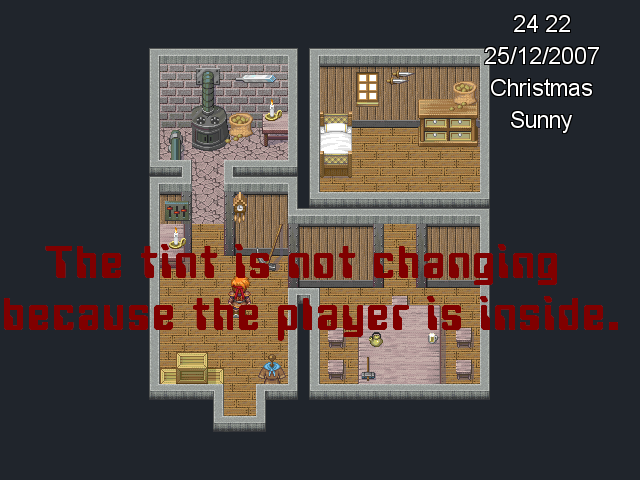 # This Time System will make your game have daytime and nighttime periods. # Turns ATES's screen tinting on. # Turns ATES's screen tinting off. # Turns ATES's clock display on. # Turns ATES's clock display off. # Turns ATES's weather system on. # Turns ATES's weather system off. # value used will cancel the execution of this command. # This command unlocks the current weather. # Sets the current weather to the weather at index INDEX. # Sets the terrain to the terrain named TERRAIN_NAME. # Returns true if ATES is turned on, otherwise false. # Returns true if ATES tinting is turned on, otherwise false. # Returns true if the weather system is turned on, otherwise false. # the assigned switch instead. # Returns the name of the current time of day. # TVARIABLE) and weather (check WVARIABLE). # tinting is being used. # ATES.weather_on to enable the components. # it means: 1st row - "HOURS:MINUTES SUFFIX"
# 2nd row - "WEEKDAY"
# 3rd row - "DAY/MONTH/YEAR"
# 4th row - "SEASON"
# set this option to  if you want the game to start "now"
colon = @odd % 2 == 0 ? " " : ":"
No known issues, but may not work with other scripts that change the tint unless you turn tinting off. This is a finished and rereleased version of the original ATES script found here. If you are having questions or problems, please first read the original topic! Really nice script! Now I definately need to get an SD reader.. Thanks Zexion, I've had it for a while, I just was waiting for Blizz to give the main topic to me. But then he told me that it would be better to just make a new topic, so I did, and here it is. There was a bug when using this with RMX-OS because you forgot to include RMX-OS in the check whether to enable the custom input module. I quickly fixed it and updated the script. Thanks Blizz. I should have known that RMX-OS had a custom Input module too. It's, once again, loading a saved game and accessing a variable that is only created upon starting a new game. Add the two marked lines in this script. This will create the new variables in a saved game if they don't exist yet. Other solution is to just wipe your saved data and start a new game. Time goes to fast!!! How to make it slow down? And when I in house, if it rain, rains indoor. How do I fix it? Been working on a game for a couple months. Been using this script, and got myself a bug. script 'interpreter 7' line 274: typeerror occurred. It happens when i'm in a town/map and the weather changes to clouds and i exit out to the world/map using the transfer player event. If the weather don't change i don't get the error when i leave. 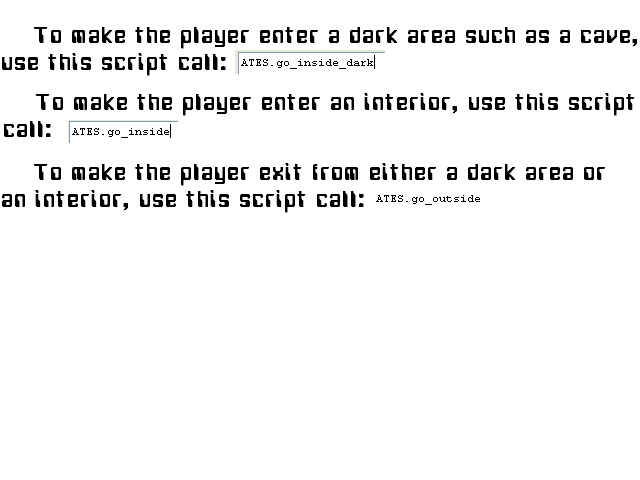 I'm coping and pasting the script as it sits in my game below. I can't for the life of me figure this out and can't find a solution anywhere. I was going to use the old 0.4 script i used back in the day but the script link as 404'd. # This allows you to turn on the weather system. # This allows you to turn off the weather system. # on inflict "Sleep" on one enemy. # using the ATES.on and ATES.tint_on commands together. First off, use code tags when pasting any code at all. Secondly, there really was no point to post the entire script when it's already provided in the OP. Besides, it's a huge script--you can't even fit the entire thing in a message post. I edited your post to reflect these changes. 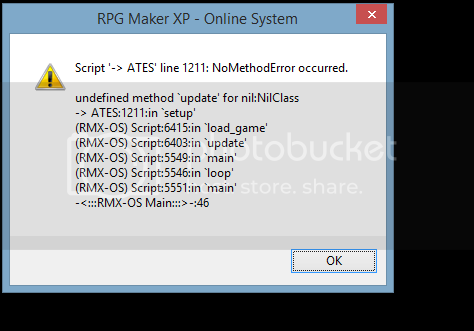 The error message is stating that a Script event command is acting weird. Do you have any events, probably parallel process or autorun, that uses a script call? If so, post it. Yes i do have a parallel process using a call script, on both the map transferring from and one on the map transferring too. Blown away you got that from the info i provided, anyways here are how each are set up. I know its basically the same thing besides the speed change, and the reason behind me doing it that way was because if a player saved the game and i had manually set tint options and disabled the ATES i wanted to make sure everything weather related stayed on when he returned. I have parallel events on every map setting up the conditions of each. I'm guessing you will tell me to remove the script calls which i will be doing if necessary. Oh and sorry for ticking ya off with the script paste....new as you can tell. That being said i used too talk with blizzard back on rpgmaker rmx or something back in 07. Decided i wanted to finish at least one game before i kick the bucket. Take care and thanks for replying. That last line is returning a Tone object, which is then returned to the Interpreter and compared with false, which gives us our error. So yeah, just put return true in those two methods and it should be good. That did the trick......thank you kindly. Greatly appreciate your time, Though my game won't be as crazy as some of the others i saw i'm going to finish it. I think the biggest thing i got going for mine is i'm doing all the music for it. Take care and hope you have a great weekend. Script now updated to v1.02. And thanks for confirming the solution. Fixed in OP. There were actually a couple more script calls that didn't have any return statements in them so I fixed those other ones too, just in case. I'm having an error when using ATES.advance (0, 2, 0, 0, 0) I want the time to advance 2 hours and instead of that, it always advance 24 hours.